For breakfast this morning the hubb and I met our good friend Amy for our Friday morning tradition at Blue Grass Grill. I've raved about this Charlottesville spot before, and I'll rave again. They have the most amazing breakfast options, and this morning's was my favorite. Sadly, I have no pictures, so I'll try to describe with the best of my foodie lingo. Breakfast: Imagine this...a bed of perfectly roasted potato hashbrowns topped with spinach, tomatoes, mushrooms, feta and mozzarella cheeses. Stick the whole dish in the oven and broil until the cheese is perfectly melted, bubbly and browned in a couple of spots. Oh. my. goodness. I ate the whole thing. I also ate 1/2 of the perfect honey wheat biscuit that comes as a side, with blackberry preserves. It was definitely an indulgent breakfast. There were healthier options, like the veggie egg white omelet without cheese that I had last time we were there, but I just could not say no to this skillet. Luckily, lunch was nice and healthy. 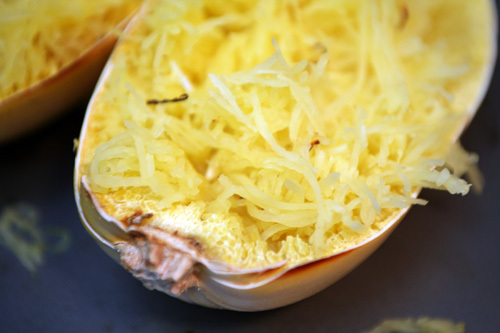 Remember this spaghetti squash from last night? I thought about using him in our Mexican Dip, but was vetoed by the hubb. So instead, 1/2 the squash went into a pyrex container with a mish mash of other eats to make my lunch today. Lunch: Roasted spaghetti squash, steamed broccoli and leftover lentil salad (the last of it!). Even though I had a big breakfast this morning, when the clock struck 12:30 my body was ready to eat. This is a big pyrex container, 8" x 6" x 2". 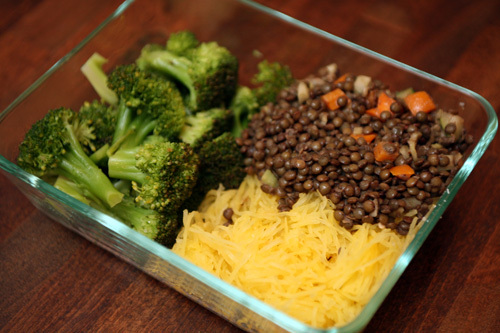 That's 1/2 a spaghetti squash, 1 cup of lentil salad and 1 broccoli floret. Apparently I wasn't as hungry as I thought because I only ate about 1/2 the contents. I thought about having the rest as an afternoon snack (or second lunch) but just wasn't feeling it. My tum's been a bit iffy today, perhaps all of the cheese last night and this morning? You'd think I'd learn...but I love my cheese too much. 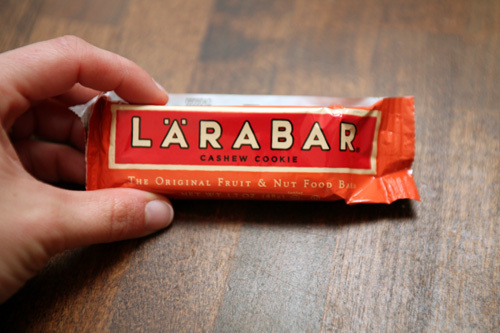 Afternoon Snack: Cashew Cookie Larabar. This was my first experience with the cashew cookie flavor. The taste was great, but it was drier than other Larabar flavors I've tried...more crumbly. Has anybody else tried this bar? Was mine a textural dud? The peanut butter cookie flavor I had last week was SO much better, much softer and more cookie-like. For dinner I was planning on making Tofu Veggie Masala, but the last thing I wanted to do when I got home was cook. 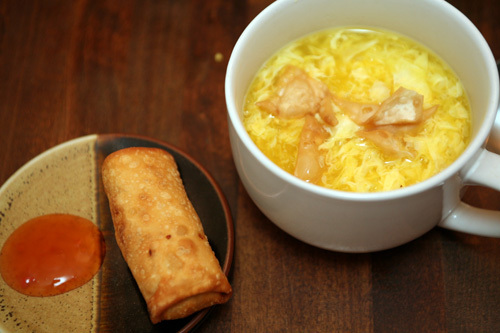 When I woke up from my nap, my hubb had ordered the perfect dinner to help my sore throat and queasy tummy...Egg Drop Soup. I'm feeling better than I was earlier, but I'm going to head to bed so that I can get a good night's sleep before my 5 MILE RUN tomorrow!!! I can't believe that tomorrow morning I will be at the halfway point in my 10-miler training!!! WooHoo!! !